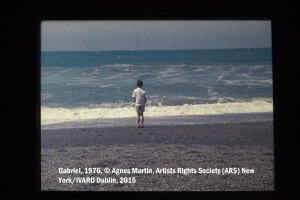 We are delighted to welcome Dr. Ed Krčma, Lecturer in History of Art, UCC, who will introduce this screening. Currently the subject of a major retrospective at Tate Modern, the life’s work of Canadian born artist Agnes Martin (1912-2004) displays an unflinching dedication to the expression of her ideas through abstract, geometric forms. 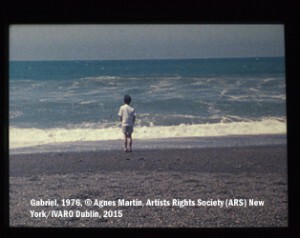 In a rare digression from painting, and the only film Martin ever completed, Gabriel oscillates between fixed views of abundant nature to tracking the explorations of a young boy through the New Mexico landscape near where the artist lived. Evocative of the understated and transparent luminosity of her square canvases, Gabriel offers insight to the profound status nature held for martin in an absorbing study conveying her acute sensitivity to natural occurrences of colour, pattern and form. Curated by Leah Reynolds and Alice Butler.